proximity and unity: grouping related items so they are viewed as one thing, used to indicate relationships, organization, and page content. Avoid copyright infringement; do not risk subjecting your company or yourself to a lawsuit. Graphs and charts must present the parts in their honest relationship to each other. The source for data used in graphs and charts must be documented. Pictures and drawings should not be exaggerated or make false implications. Writers face conflicts of interest when their job requires them to "bury" information in small print, all caps, or a too-busy design in order to claim that they presented the information but so that the audience will be unlikely to actually read it. Technical communicators should be reader advocates and protect readers from unethical designs. Use the ethics code of the Society of Technical Communicators or some other professional organization to help you fight such on-the-job conflicts. For most documents, avoid templates because they are usually badly designed. The document title is the only heading that should not have text introducing the heading. 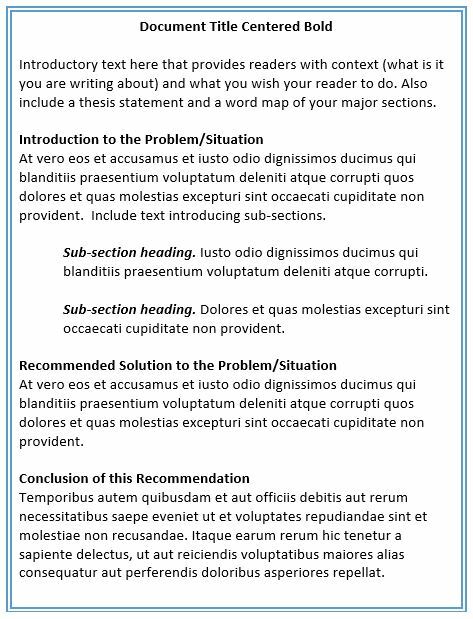 Text should precede all headings and introduce the sections to come. Never put two headings in a row with no text separating them. When following APA guidelines, heading will be black font on white background unless the writer had a good reason to use color. Many professional publications print only black on white, so color will turn into some shade of grey. Introduce relevant visuals in the text before the visual and put visuals that merely elaborate in an appendix. Before or after the visual, explain it. Do not rely on the visual's content to be self-explanatory. Readers do not want to work that hard and consider it your job to explain what it means and why you put it in the document. Make sure all the elements in the visual are legible and clear. Consider the situations in the Visuals Quiz chart, right column, and fill in the blank with a choice from the illustrations in theeft column. To check your responses , swipe your cursor over the white space below this line. What is wrong with having two headings in a row with no text between the headings? What is wrong with putting an Introduction heading after the document title? Why is APA style always black and white? Color can aid navigation in a complex table, so why not use color in tables?